Emodin, Colon cancer, SW620, Inhibitory. Colon cancer is one of common malignant tumors in gastrointestinal tract. With the development of economy and the change of life style, the incidence of colon cancer is increasing day by day, and the incidence is higher especially in population with 41-51 years old . More than half of colon cancer cases originate from the adenoma canceration. The morphology of colon cancer is presented by the hyperplasia, adenoma and canceration and corresponding chromosomal changes at different stages . With the development of molecular biology, the concurrent gene expressions of molecules are gradually recognized. It is believed that, the occurrence and development of colon cancer is a multi-step, multi-stage and multiple genes involved process . The surgery combined with chemotherapy is the main treatment for colon cancer . It is shown that most natural products have the anti-tumor activity, and can regulate and improve the immune function of body . It is a hot spot to search for anti-tumor natural products with high efficiency and low side effects. Emodin is the main active ingredient of rhubarb. Researches [6,7] show that, emodin has a variety of pharmacological effects including anti-infection, inhibition of inflammation reaction, antibacterial activity and others. In recent years, it is found that, emodin has inhibitory effects on a variety of tumor cells and solid tumors in vivo and in vitro, and can induce the apoptosis of tumor cells [8,9]. However, the application of emodin on treatment of colon cancer cells is less reported. If it is confirm that emodin has therapeutic effects on colon cancer, this will further broaden the range of therapeutic medicine for colon cancer and the application range of emodin. In this study, it is the first time to investigate the effects of emodin on the proliferation, apoptosis and cell cycle of human colon cancer SW620 cells, and explored the related mechanisms. The objective was to provide a basis for further clinical application of emodin to treating colon cancer. Human colon cancer SW620 cells were purchased from the Cell Bank of Chinese Academy of Sciences (Shanghai, China). The cells were cultured in RPMI 1640 medium containing 10% fetal bovine serum (Fuzhou Maixin Biotechnology Development Co., Ltd., Fuzhou, China) in a constant temperature incubator (37ºC, 5% CO2, saturated humidity). The cells in logarithmic growth phase were used for the next experiments. SW620 cells in logarithmic growth phase (1 × 105 cells/ml) were inoculated in 96-well culture plate, 100 μL in each well. Based on the suitable dose range obtained in preliminary experiments, emodin (Sigma-Aldrich Corp., MO, USA) was diluted with RPMI 1640 medium into 5 different concentrations (10, 20, 40, 80, 160 μmol/L), and then was added to the 96-well plates, 100 μL in each well, 5 wells in each group. The control group was treated with equal volume of RPMI 1640 medium. The culture was performed at 37ºC, with 5% CO2 and saturated humidity, for 24, 48 and 72 h, respectively. At the end of culture, 20 μL MTT (5 mg/ml, Sigma-Aldrich Corp., MO, USA) was added to each well, followed by continued culture for 4 h. Finally the supernatant was discarded, and 100 μL DMSO (Sigma-Aldrich Corp., MO, USA) was added. The Optical Density (OD) value of each well was detected at 540 nm in Multiskan FC microplate reader (Thermo Fisher Scientific, Inc., MA, USA). The inhibition rate of SW620 cell growth was calculated as follows: inhibition rate (%)=(1-ODsample/ODcontrol) × 100%. SW620 cells in logarithmic growth phase (1 × 105 cells/ml) were inoculated in 6 bottles with volume of 50 ml, 1 ml for each bottle. After cell adhesion, 1 ml of emodin with 5 different concentrations (10, 20, 40, 80, 160 μmol/L) was added to the bottle. The control group was added with 1 ml of RPMI 1640 medium. The culture was performed at 37ºC, with 5% CO2 and saturated humidity for 48 h. The mixture was centrifuged at 256 Xg for 10 min. The cells were collected, followed by washing using Phosphate Buffer Saline (PBS) (pH 7.4) (Fuzhou Maixin Biotechnology Development Co., Ltd., Fuzhou, China) for 3 times. Finally the propidium staining was performed for 30 min, and the apoptosis of SW620 cells was measured by flow cytometry. Expressions of B-Cell Lymphoma-2 (Bcl-2), Bcl-2 associated X (Bax) and p53 protein were detected by Western-blot method. The related reagents were provided by Fuzhou Maixin Biotechnology Development Co., Ltd. (Fuzhou, China). SW620 cells which were treated with different concentrations of emodin for 48 h were collected, and were washed with PBS for 3 times. 100 μL of cell lysate was added. The mixture was centrifuged at 256 Xg for 10 min, and then the protein was quantified. The 10% sodium dodecyl sulfate polyacrylamide gel electrophoresis was performed for 3 h to separate the protein, followed by transferring to nitrocellulose membrane. After washing with PBS for 3 times, 15 min for each time, 1% bovine serum albumin was used to block the non-specific antigen for 2 h. After blocking, the membranes were incubated with primary antibodies and second antibodies, followed by the corresponding incubation, respectively. Enhanced chemiluminescence substrate was added, followed by exposing with Gel Doc 2000 gel Imaging System (Bio-Rad Laboratories, Inc., PA, USA). The relative levels of Bcl-2, Bax and p53 protein expressed as ratio of OD to β-actin for each group. All statistical analysis was carried out using SPSS 22.0 software (SPSS Inc., Chicago, IL, USA). The data were presented as mean ± SD, and were compared using single factor analysis of variance with SNK-q test. P<0.05 was considered as statistically significant. Emodin with all concentration of 10-160 μmol/L could inhibit the proliferation of SW620 cells. The tumor cell growth inhibition rate increased with the increase of both the emodin concentration and treatment time. When the emodin concentration was 160 μmol/L, and the treatment time was 72 h, the tumor cell growth inhibition rate was the highest, which was 91.04 ± 4.11% (Figure 1). Figure 1: Effect of emodin on proliferation of SW620 cells. aP<0.05 compared with 10 μmol/L group; bP<0.05 compared with 20 μmol/L group; cP<0.05 compared with 40 μmol/L group; dP<0.05 compared with 80 μmol/L group. 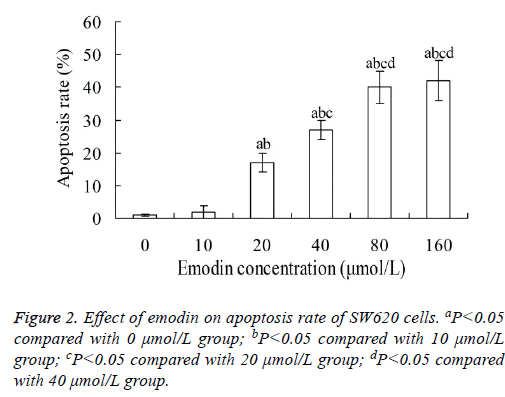 Figure 2 showed that, when SW620 cells were treated with emodin for 48 h, their apoptosis rate increased with the increase of emodin concentration. The apoptosis rates in 20, 40, 80 and 160 μmol/L emodin group were significantly higher than that in 0 and 10 μmol/L emodin group, respectively (P<0.05). The highest apoptosis rate was 42.12 ± 6.02%. However, there was no significant difference between 80 and 160 μmol/L emodin groups (P>0.05). Figure 2: Effect of emodin on apoptosis rate of SW620 cells. aP<0.05 compared with 0 μmol/L group; bP<0.05 compared with 10 μmol/L group; cP<0.05 compared with 20 μmol/L group; dP<0.05 compared with 40 μmol/L group. After treatment with emodin, the cycle of SW620 cells was obviously changed. The percentage of SW620 cells in G0/G1 phase in 10, 20, 40, 80 and 160 μmol/L emodin group were significantly higher than that in 0 μmol/L emodin group, respectively (P<0.05), and the percentage of SW620 cells in S phase in 10, 20, 40, 80 and 160 μmol/L emodin group were significantly lower than that in 0 μmol/L emodin group, respectively (P<0.05). In addition, there was significant difference of percentage of SW620 cells in G0/G1 phase or S phase between each two groups among 10, 20, 40, 80 and 160 μmol/L emodin (P<0.05), with no significant difference between 80 and 160 μmol/L emodin groups (P>0.05) (Table 1). aP<0.05 compared with 0 μmol/L group; bP<0.05 compared with 10 μmol/L group; cP<0.05 compared with 20 μmol/L group; dP<0.05 compared with 40 μmol/L group. Table 1. Effect of emodin on cycle of SW620 cells (%). As shown in Figure 3, the relative expression level of Bcl-2 protein in SW620 cells decreased with the increase of emodin concentration. The relative expression level of Bcl-2 protein in 20, 40, 80 and 160 μmol/L emodin group was significantly lower than that in 0 and 10 μmol/L emodin group, respectively (P<0.05). In addition, there was significant difference of Bcl-2 protein level between each two groups among 20, 40, 80 and 160 μmol/L emodin (P<0.05), with no significant difference between 0 and 10 μmol/L emodin groups (P>0.05). Figure 3: Effect of emodin on expression of Bcl-2 protein in SW620 cells. aP<0.05 compared with 0 μmol/L group; bP<0.05 compared with 10 μmol/L group; cP<0.05 compared with 20 μmol/L group; dP<0.05 compared with 40 μmol/L group; eP<0.05 compared with 80 μmol/L group. Bcl-2: B-Cell Lymphoma-2. 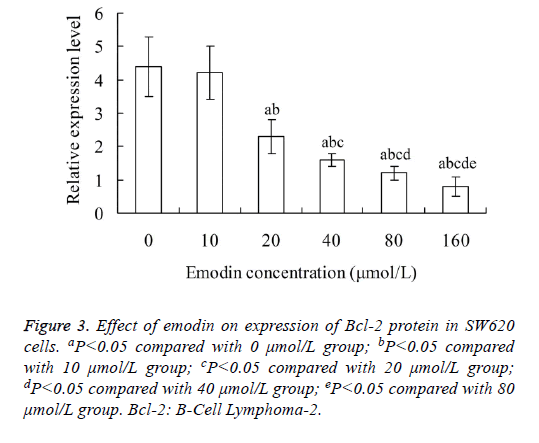 Figure 4 showed that, the relative expression level of Bax protein in SW620 cells increased with the increase of emodin concentration. The Bax protein level in 40, 80 and 160 μmol/L emodin group was significantly higher than that in 0, 10 and 20 μmol/L emodin group, respectively (P<0.05). There was significant difference of Bax protein level between each two groups among 40, 80 and 160 μmol/L emodin (P<0.05), with no significant difference among 0, 10 and 20 μmol/L emodin groups (P>0.05). Figure 4: Effect of emodin on expression of Bax protein in SW620 cells. aP<0.05 compared with 0 μmol/L group; bP<0.05 compared with 10 μmol/L group; cP<0.05 compared with 20 μmol/L group; dP<0.05 compared with 40 μmol/L group; eP<0.05 compared with 80 μmol/L group. With the increase of emodin concentration, the relative expression level of p53 protein in SW620 cells also increased. There was significant difference of p53 protein level between each two groups among 0, 10, 20 40 and 80 μmol/L emodin (P<0.05), with no significant difference between 80 and 160 μmol/L emodin groups (P>0.05) (Figure 5). Figure 5: Effect of emodin on expression of p53 protein in SW620 cells. aP<0.05 compared with 0 μmol/L group; bP<0.05 compared with 10 μmol/L group; cP<0.05 compared with 20 μmol/L group; dP<0.05 compared with 40 μmol/L group; eP<0.05 compared with 80 μmol/L group. It is found that, the occurrence and development of many kinds of malignant tumors are caused by the serious blocking of the cell apoptosis process, which results in the infinite malignant proliferation of tumor cells . Apoptosis plays an important role in the control of cell proliferation, tumorigenesis and growth. Inducing apoptosis has become a new target for cancer therapy . The commonly clinically used chemotherapy drugs can induce the apoptosis of tumor cells, but they often have a lot of side effects. Therefore, more and more attention has been paid on the search for new anticancer drugs from natural plants and animals. Rhubarb is the root and rhizome of medicinal plant Rheum palmatum L. In traditional Chinese Medicine, rhubarb has the function of purgation, purging heat, blocking bleeding, detoxification, invigorating circulation and removing blood stasis . Emodin is the main active ingredient of rhubarb. Research shows that, emodin can inhibit the growth of tumor cells, induce the apoptosis, inhibit the angiogenesis, induce tumor cell differentiation, reverse tumor cell resistance, and enhance the sensitivity of tumor cells to drugs. It plays an antitumor role with multiple targets and multiple pathways . Emodin has a strong inhibition and killing effect on liver cancer, breast cancer, lung cancer, bladder cancer and cervical cancer, and has a time- and dose-dependent manner, but has no obvious toxicity to normal cells . This study investigated the effects of emodin on the proliferation, apoptosis and cycle of human colon cancer SW620 cells. Results showed that, emodin could inhibit the proliferation of SW620 cells and promote the apoptosis. In addition, emodin could block most cells in the G0/G1 phase. 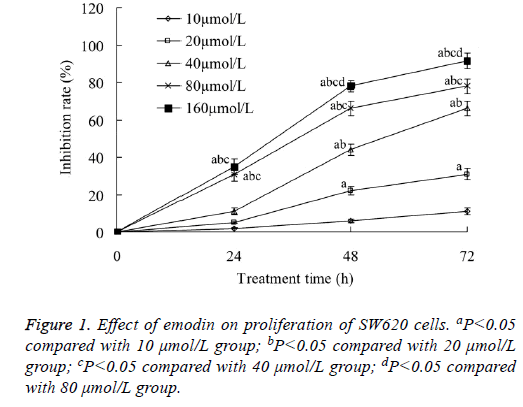 This indicates that, emodin has inhibitory effect on the growth of SW620 cells. Bcl-2 is the B cell lymphoma/leukemia-2 gene. This gene has the carcinogenicity. The promotion of tumor growth is not based on by its induction of tumor cell proliferation, but on its regulation of apoptosis. Bcl-2 can regulate the permeability of mitochondrial membrane to prevent the release of cytochrome C into the cytoplasm and inhibit cell apoptosis . On the one hand, the excessive expression of Bcl-2 protein can greatly reduce the occurrence of apoptosis. On the other hand, the expression level of Bcl-2 protein is directly proportional to the sensitivity of apoptosis . Bax is a member of Bcl-2 family, which is highly homologous to Bcl-2. However, the function of Bax is contrary to Bcl-2. Bax can induce the apoptosis. Bax directly binds to the mitochondrial membrane, and change the membrane permeability, which causes the release of cytochrome C into the cytoplasm, and activates the Caspase family, thus inducing the apoptosis . Results of this study showed that, the relative expression level of Bcl-2 protein in SW620 cells decreased with the increase of emodin concentration, and the relative expression level of Bax protein increased with the increase of emodin concentration. This indicates that, emodin can down-regulate the expression of Bcl-2 protein and up-regulate the expression of Bax protein in SW620 cells, which may be related to its inhibitory effect on SW620 cells. As a tumor suppressor gene, p53 is a hot spot in the research of tumor apoptosis in recent years. It is reported that, more than 50% of human tumors are related to the deletion or mutation of p53 gene . p53 has the ability of monitoring the integrity of cell genome, blocking the cell proliferation and promoting the apoptosis. When the damage of DNA in some phase of cell cycle occurs, p53 initiates the related program to repair the damage. If the repair fails, the program of inducing apoptosis is initiated, and the mutant cells are eliminated. Therefore, p53 is called as the "molecular police" . In the present study, with the increase of emodin concentration, the relative expression level of p53 protein in SW620 cells was increased. This indicates that, the inhibitory effect of emodin on SW620 cells may also be related to its up-regulation of p53 protein expression. In conclusion, emodin can inhibit the growth of human colon cancer SW620 cells. The possible mechanism may be related to its up-regulation of Bax and p53 protein expression in SW620 cells, and down-regulation of Bcl-2 protein expression in SW620 cells. This study has provided a basis for further clinical application of emodin to treating colon cancer. However, whether there are other mechanisms on inhibitory effect of emodin on SW620 cells, and whether emodin has inhibitory effect on other types of colon cancer cells need to be further investigated. In addition, in the next, the in vivo experiments should be performed to study the anti-tumor effects of emodin. Bockelman C, Engelmann BE, Kaprio T, Hansen TF, Glimelius B. Risk of recurrence in patients with colon cancer stage II and III: a systematic review and meta-analysis of recent literature. Acta Oncol 2015; 54: 5-16. McCarthy PA, Rubesin SE, Levine MS, Langlotz CP, Laufer I, Furth EE, Herlinger H. Colon cancer: morphology detected with barium enema examination versus histopathologic stage. Radiology 1995; 197: 683-687. Takahashi T, Shigematsu H, Shivapurkar N, Reddy J, Zheng Y, Feng Z, Suzuki M, Nomura M, Augustus M, Yin J, Meltzer SJ, Gazdar AF. Aberrant promoter methylation of multiple genes during multistep pathogenesis of colorectal cancers. Int J Cancer 2006; 118: 924-931. Sargent DJ, Goldberg RM, Jacobson SD, Macdonald JS, Labianca R, Haller DG, Shepherd LE, Seitz JF, Francini G. A pooled analysis of adjuvant chemotherapy for resected colon cancer in elderly patients. N Engl J Med 2001; 345: 1091-1097. Dholwani KK, Saluja AK, Gupta AR, Shah DR. A review on plant-derived natural products and their analogs with anti-tumor activity. Ind J Pharmacol 2008; 40: 49-58. Chang CH, Lin CC, Yang JJ, Namba T, Hattori M. Anti-inflammatory effects of emodin from ventilago leiocarpa. Am J Chin Med 1996; 24: 139-142. Wang HH. Antitrichomonal action of emodin in mice. J Ethnopharmacol 1993; 40: 111-116. Huang Q, Shen HM, Ong CN. Inhibitory effect of emodin on tumor invasion through suppression of activator protein-1 and nuclear factor-kappaB. Biochem Pharmacol 2004; 68: 361-371. Wang Y, Yu H, Zhang J, Ge X, Gao J1. Anti-tumor effect of emodin on gynecological cancer cells. Cell Oncol (Dordr) 2015; 38: 353-363. Sisto M, DAmore M, Caprio S, Mitolo V, Scagliusi P, Lisi S. Tumor necrosis factor inhibitors block apoptosis of human epithelial cells of the salivary glands. Ann N Y Acad Sci 2009; 1171: 407-414. Kerr JF, Winterford CM, Harmon BV. Apoptosis. Its significance in cancer and cancer therapy. Cancer 1994; 73: 2013-2026. Gao XS. Rhubarb application for global health--a review on the articles of the first international symposium on rhubarb. Chin J Integr Tradit West Med (Chin) 1990; 10: 754-757. Wei WT, Lin SZ, Liu DL, Wang ZH. The distinct mechanisms of the antitumor activity of emodin in different types of cancer (Review). Oncol Rep 2013; 30: 2555-2562. Jahnke GD, Price CJ, Marr MC, Myers CB, George JD. Developmental toxicity evaluation of emodin in rats and mice. Birth Defects Res B Dev Reprod Toxicol 2004; 71: 89-101. Cory S. Regulation of lymphocyte survival by the bcl-2 gene family. Annu Rev Immunol 1995; 13: 513-543. Chao DT, Korsmeyer SJ. BCL-2 family: regulators of cell death. Annu Rev Immunol 1998; 16: 395-419. Jurgensmeier JM, Xie Z, Deveraux Q, Ellerby L, Bredesen D. Bax directly induces release of cytochrome c from isolated mitochondria. Proc Natl Acad Sci USA 1998; 95: 4997-5002. Kohler MF, Marks JR, Wiseman RW, Jacobs IJ, Davidoff AM, Clarke-Pearson DL, Soper JT, Bast RC Jr, Berchuck A. Spectrum of mutation and frequency of allelic deletion of the p53 gene in ovarian cancer. J Natl Cancer I 199; 85: 1513-1519. Shay JW1, Werbin H, Funk WD, Wright WE. Cellular and molecular advances in elucidating p53 function. Mutat Res 1992; 277: 163-171.